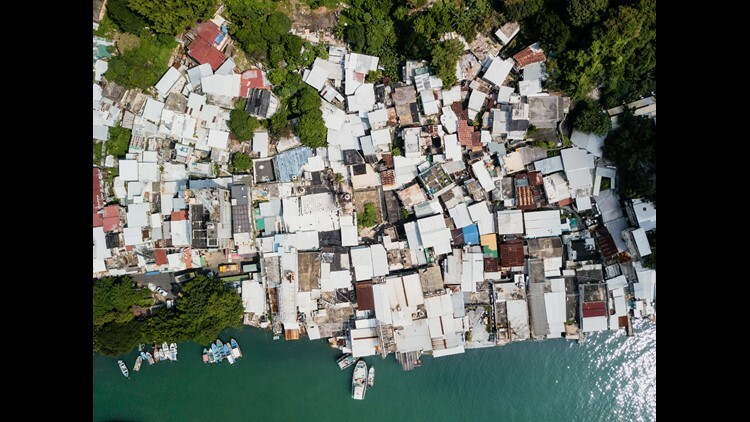 An aerial view shows the flood prone coastal village of Lei Yu Mun, two days before the expected arrival of Super Typhoon Mangkhut in Hong Kong on September 14, 2018. Rains cover the city as strong winds batter houses and buildings lying on the path of Typhoon Mangkhut as it makes landfall on September 15, 2018 in Tuguegarao city, northern Philippines. TUGUEGARAO, Philippines – Typhoon Mangkhut lashed the northern Philippines on Saturday, with its powerful winds and rain setting off landslides and destroying homes, leaving at least three people dead and six missing, as the storm barreled toward southern China. The most powerful typhoon to hit the disaster-prone Philippines this year slammed ashore before dawn in Cagayan province on the northeastern tip of Luzon island, a breadbasket that is also a region of flood-prone rice plains and mountain provinces with a history of deadly landslides. China and the Philippines agreed to postpone a visit by Chinese Foreign Minister Wang Yi that was to start Sunday due to the onslaught, which caused nearly 150 flights, a third of them international, to be canceled and halted sea travel. 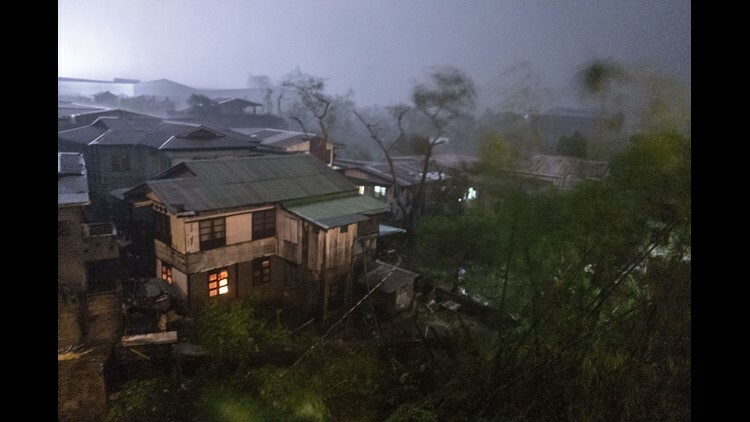 At least three people died and six others were missing in the mountain city of Baguio after ferocious winds and rain destroyed several houses and set off landslides, which also blocked roads to the popular vacation destination, said the city’s mayor, Mauricio Domogan. Authorities were verifying the drownings of three people, including two children who reportedly died as the typhoon approached. They were also checking to see what happened to about 70 men who reportedly returned to their coastal village in Cagayan to check on their homes as the typhoon drew closer Friday, sparking concerns over possible storm surges. Mangkhut’s sustained winds weakened to 105 miles per hour with gusts of up to 161 mph after it sliced northwestward across Luzon then blew out to the South China Sea, aiming at southern China and Hong Kong, where residents braced for the worst. With the weather easing, officials warned there was lingering danger. “It’s still a life and death situation,” Defense Secretary Delfin Lorenzana said by phone, citing past drownings in swollen rivers in mountain provinces after storms have passed. Storm warnings remained hoisted in 10 northern provinces, including Cagayan, which could still be lashed by devastating winds, forecasters said. Thousands of people in the typhoon’s path had been evacuated. At daybreak in Cagayan’s capital, Tuguegarao, Associated Press journalists saw a severely damaged public market, its roof ripped apart and wooden stalls and tarpaulin canopies in disarray. Outside a popular shopping mall, debris was scattered everywhere and government workers cleared roads of fallen trees. Many stores and houses were damaged but most residents remained indoors as occasional gusts sent small pieces of tin sheets and other debris flying dangerously. The Tuguegarao airport terminal was badly damaged, its roof and glass windows shattered by strong winds, which also sent chairs, tables and papers flipping about inside, Lorenzana said. The typhoon struck at the start of the rice and corn harvesting season in Cagayan, a major agricultural producer, prompting farmers to scramble to save what they could of their crops, Cagayan Gov. Manuel Mamba said. A government damage assessment was underway except in areas still being battered by winds and rain. Two air force C-130 cargo planes and 10 helicopters were on standby in Manila to help transport rescuers and aid supplies. More than 5 million people were at risk from the storm, which the Hawaii-based Joint Typhoon Warning Center downgraded from a super typhoon. Mangkhut, however, was still punching powerful winds and gusts equivalent to a Category 4 Atlantic hurricane. In Hong Kong, Security Minister John Lee Ka-chiu urged residents to prepare for the worst as the storm barreled toward the southern Chinese city. Cathay Pacific said all of its flights would be canceled between 2:30 a.m. local time on Sunday and 4 a.m. Monday. In nearby Fujian province in China, 51,000 people were evacuated from fishing boats and around 11,000 vessels returned to port on Saturday morning. China’s National Meteorological Center issued an alert saying Mangkhut would make landfall somewhere on the coast in Guangdong province on Sunday afternoon or night, packing strong winds and heavy rain. Ferry services in the Qiongzhou Strait in southern China were halted on Saturday and helicopters and tugboats dispatched to Guangdong to transfer offshore workers to safety and warn ships about the typhoon, the state-run Xinhua News Agency reported. Mangkhut, the Thai word for mangosteen fruit, is the 15th storm this year to batter the Philippines, which is hit by about 20 a year and is considered one of the world’s most disaster-prone countries. In 2013, Typhoon Haiyan left more than 7,300 people dead or missing, flattened villages, swept ships inland and displaced more than 5 million in the central Philippines.